As their plan to get fast cash slowly unravels, they are pursued by two Texas rangers – Marcus (Jeff Bridges) is an experienced veteran who is working his last case. His partner Alberto (Gil Birmingham) is along for the ride, an old friend who is willing to endure Marcus’ not so gentle teasing and curmudgeonly ways. Fortunately, this film is elevated from your average cops and robbers movie. It is enhanced and nuanced in large parts due to a poignant script by Taylor Sheridan and cinematography that reinforces the message. Sheridan tells the story of the working mans’ struggle to hold onto his land and fiscally survive when large companies have all of the power and control. It is difficult to not empathize on some level with the plight of the Howard brothers. You may not agree with their methods, but you can understand the reasons behind their actions. Another strength of the film is its use of opposites. Each yin has its equally strong yang. Toby is contained while Tanner is wild. Marcus is old school, after the criminals and unconcerned with the means to get there, while Alberto is inoffensive and by the books. The greatest opposite is the Texas scenery and landscaping. The times they are a changing, and it is apparent as you see the towns that are being shutdown, the cowboys struggling to survive and the large buildings that are overshadowing what once was. The message is constantly reinforced as the story continues. Bridges, Foster and Pine all give strong performances and easily transform into their characters. 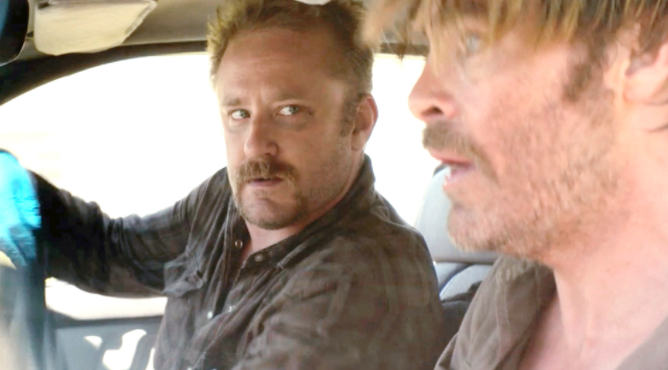 Although slow to start, Hell or High Water finishes strong and will pull viewers in. A Must-See! 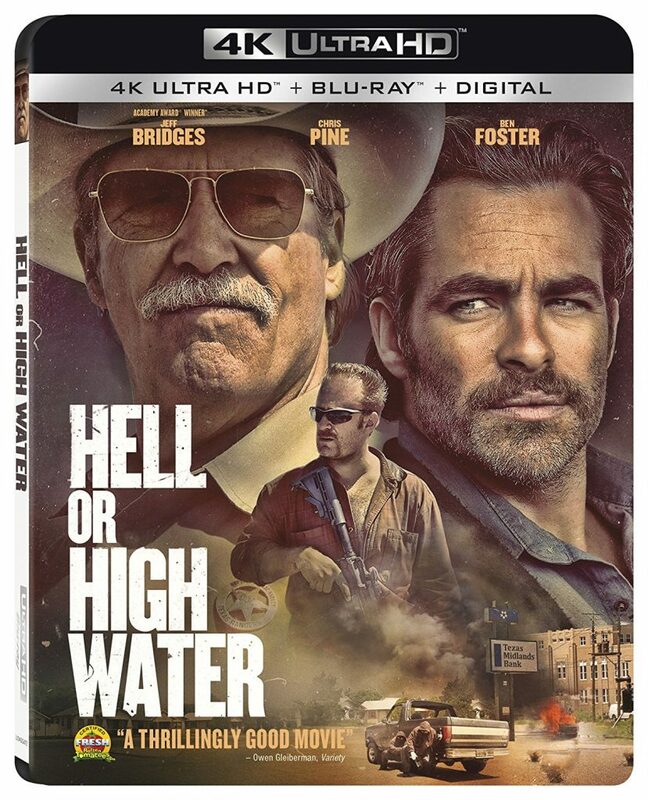 The Video: ‘Hell or High Water‘ comes with a great 4K UHD transfer with Dolby Vision that is presented in 2.40:1 aspect ratio. Watching the film in its 1080p HD transfer, then in its 4K UHD with Dolby Vision, you will immediately be able to tell a difference in both the color and detail with each image. The 4K UHD with Dolby Vision is for sure the best way to watch this incredible movie. Colors are more vibrant and nuanced in each scene. With its rustic vibe, browns, oranges, and greens look more luscious and deep. There are certain scenes that have filters applied, mostly blue or orange filters, which looks great stylistically here. With the Dolby Vision, the other colors stand out brighter, such as the lime green sports car or the many star ads on the wall with all of their glorious primary colors. Other natural colors such as the white and brown horses look incredible. The red blood that appears throughout also stands out with varying degrees of dark reds that pinpoint the violence perfectly. Normally when you have filters applied, the detail can suffer a bit, but that’s not the case with this Dolby Vision 4K UHD release. Detail is sharp and vivid throughout with closeups revealing individual facial stubble and pores, as well as facials wounds when applicable. Take a look at the buried car in the dirt, you’ll be able to see all of the imperfections of the Earth and dents and dirt on the car. Also, the textures of the western costumes and interior of the vehicles tend to show excellent stitching as do the cowboy hats. It was impressive to say the least. Black levels are very deep and inky and the skin tones are natural when not in the applied filters. There was some minor noise that cropped up when dirt and dust is kicked up, but it’s nothing to write home about, leaving this video presentation with great marks. The Audio: This release says there is a Dolby Atmos track available, but in reality, there is no Atmos option, but instead a lossless DTS-HD MA 5.1 mix. Someone over at Lionsgate definitely messed up. The 5.1 mix though sounds good. Sound effects are loud with good directionality. Gunshots, vehicles driving by, and horses galloping all sounds exquisite and robust. The gun shots and car engines have a low end roar that brings some good bass that never crosses into rocky territory. The ambient noises of other people talking, nature sounds, and other various restaurant noises all sound good as well. The score always adds to the emotional tone as well as the action and suspense, and the dialogue is clear and easy to follow without any pops, cracks, hiss, and shrills. Filmmaker Q&A (HD, 30 Mins.) – A cool Q&A with an audience with the director and actors of the film, sans Ben Foster. They talk about making the film and their characters. Enemies Forever: The Characters of Hell or High Water (HD, 14 Mins.) – A cool look at the characters of the film and the actors that played them with the writer talking about the story and it’s players. Visualizing the Heart of America (HD, 10 Mins.) – This focuses on the on location filming and its surroundings. Damaged Heroes: The Performances of Hell or High Water (HD, 13 Mins.) – More discussion on the characters of the story and the actors that play them. Red Carpet Premiere (HD, 2 Mins.) – A ver short montage of footage from the red carpet from the Texas premiere of the movie with clips of the movie spliced in. ‘Hell or High Water‘ is a fantastic film that is gripping, thrilling, and a lot of fun with some amazing layered characters. The performances by everyone are top notch and the overall story is quite impressive. The 4K UHD release comes with the Blu-ray copy as well as a Digital Download code. The Dolby Vision looks amazing and is an upgrade from the Blu-ray, but even though it says Dolby Atmos Audio on the box, it is not included here. Only a DTS-HD 5.1 option. The extras are above average too. This is a great film for sure, but due to the mistakes in the audio and the not-so-excellent extras, I’m going to say this one is Recommended Only, and not Highly Recommended! This entry was posted on Monday, February 19th, 2018 at 7:48 pm	and is filed under Film, News, Podcast. You can follow any responses to this entry through the RSS 2.0 feed. You can skip to the end and leave a response. Pinging is currently not allowed. « Media-Ocrity #71 – Kung Fury, Marvel Moments, TV Shows and Video Games!